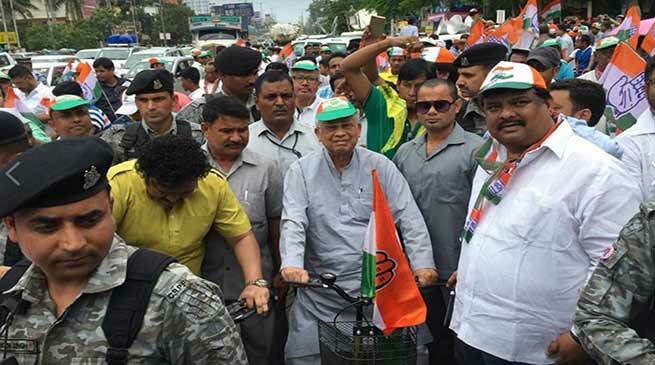 Assam Pradesh Congress Committee (APCC) members on Tuesday took out a bicycle rally in Guwahati as a part of “Betrayal Day” observed by All India Congress Committee against the central government . Former chief minister Tarun gogoi also took part in this bicycle rally . The members have also protested against the price rise of Petrol and Diesel in Guwahati. The protest rally has led to a massive traffic jam in the area. Public have alleged that such unplanned protests in the city held from time to time have served no purpose and that it only creates trouble for the common people at large. Earlier, APCC president, Ripun Bora said, “They have shattered and completely demolished the expectations of the people in Guwahati”. He expressed that nothing has been done in Guwahati. He said this is simply declaration; until it is transformed into reality it is meaningless.